The intention with this page is to try and give some understanding of the background to public houses in Qatar. As a consequence the page really deals with the housing of a generation ago, though many of the principles of the design of that period are still relevant today. This page might be usefully read in conjunction with the page dealing with the house on its lot with the focus on this page being on the rationale and principles used in the design of public housing. This public housing was the first attempt by the State to provide modern accommodation for Qatari citizens. Houses were provided as two or three bedroom buildings, and there were a limited number of designs. So as you read these notes, remember that this is really a critique of designs produced some time ago. These first photographs are intended to show a little of the character not only of the housing, but of their planning. The above photograph was taken around the early nineteen-seventies and shows the first major public housing initiative at Medinat Khalifa, a new scale of development on the outskirts north-west of Doha. This second photograph is of the same area of Medinat Khalifia. Taken thirty years later it illustrates how the area has developed in terms of the density and character of this type of development, as well as aspects of development control. The photograph is a plan view but approximately oriented in order to be more readily compared with the photograph above which was taken looking towards the south-east. The local mosque can be seen at the bottom right of the photograph. This photograph, also of the same area, is oriented with the roads running east-west and with north more or less at the top in order that it can be compared with other drawn plans. The main points to note here are the extent to which the individual lots have been built up since the original construction, the uncoordinated development, the general lack of landscaping associated with the housing, and the absolute lack of landscaping in the public sector. The term, ‘bayt sha’bi’ can be taken to mean ‘a house for the people’ and referred to a range of standardised house designs constructed for the benefit of those the government wished to assist by providing shelter. This meant that people were gathered together both from sub-standard housing and crowded accommodation, mostly in towns and settlements, as well as from those to be settled from a nomadic life-style. To some extent this represented a political decision common to other Gulf states. Generally the housing was provided on new sites on the periphery of existing urban development with those to be accommodated drawn together from scattered locations. There were exceptions as some groups were provided with discrete housing groups on the outskirts of Doha, and others relocated adjacent to where they used to live, as was the case in al-Khor, for instance. Generally speaking the layouts of the housing internally as well as within the walled compound, were inimical to the requirements and practices of the people living, for the most part, in their first modern house. Before going further you should be aware that there are additional notes dealing with layouts and public housing on other pages. These should be read in conjunction with notes on this page in order that I avoid too much repetition. It would also be useful to look at the page dealing with the household on its lot. Unfortunately, many of the subjects of these notes are scattered over different pages, and this is likely to be especially true for the subject of public housing. While I have tried to avoid repetition, the fact that these notes have been written over a long period of time has meant that I have found it difficult to make clear distinctions between many subjects. In addition I am restricted in what I can demonstrate by a lack of plans and illustrations of this subject in my possession. The first layouts for public housing were produced in the Engineering Services Department of the Ministry of Public Works. This department was also responsible for the design and construction of the public houses together with the road and sewerage systems. It is unclear where the origin of the layout design came from though, from discussion with the designer, it is likely to have been from one of the northern Arab states. 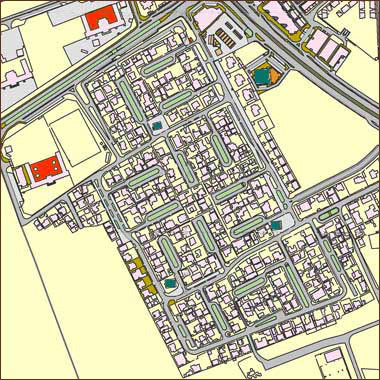 In some ways the layout of the road system for this housing followed the tradition of Arabic housing in that it was unclear and unstructured as can be seen here where Medinat Khalifa North is shown with east to the top of the photograph. While this was criticised by the planners moving into the peninsula and bringing with them their structured transportation systems based on Western thinking, there is something to be said for designing difficult layouts in that they require knowledge of the system by visitors in order to penetrate them. However, the difficulty with road systems like this is that they do not distribute traffic well and, in the case of Medinat Khalifa, a number of dangerous junctions have been incorporated. The lack of road hierarchy worked against the possible benefits of the design in that there was considerable traffic past many of the houses, speeding was encouraged along the long straight roads, and there was no provision for open space except at the ends of some of the rows of houses, but which had no uses allocated to them, an aspect that resulted in eccentricities of ownership later. While the apparent principle of lack of clarity in the road system might arguably be a benefit to the residents, the issues relating to a lack of privacy and the danger from fast moving traffic, create insuperable problems for the residents. Because of the problems that were perceived to have been created by those first public housing schemes, a different approach was investigated with a qabila that was to be moved from its old houses within their feriq in central Doha, with that area being redeveloped. The project is described in far more detail on another page, and is introduced here in order to compare briefly the principles of layout as well as explain how an alternative design for a public house was conceived. These adjacent two illustrations are of the built project – the top illustration which incorporates a variety of house types – and, below it, the theoretical scheme which was based on a traditional public house, the type dealt with in more detail below. 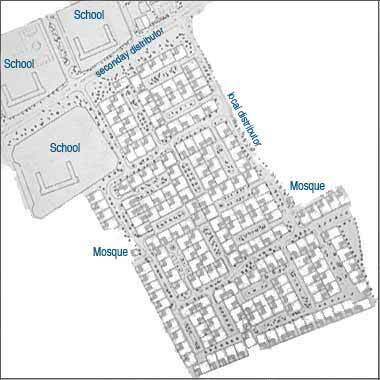 Note that a third masjid was added at the expense of a house in the built scheme, compared with the two masaajid of the original design. This provided a more even distribution for all members of the qabila. There were three key differences between the public housing layouts and the new layout that were developed in discussion with members of the qabila. As such the layout represents both a client’s wishes as well as the recommendations of a professional team. The first was that circulation was clearly defined and, where housing fronted onto it, space was provided in addition to the local road in order to provide access and parking in greater safety as well as a degree of prestige. The second principle was that of grouping house plots within culs-de-sac in order to provide privacy, together with improved security, both actually and psychologically and concomitant prestige. Thirdly, a series of pedestrian sikkaat were provided to allow easy access around the housing within the spirit and needs responded to by traditional urban design. The key difference between the two approaches has to do with the concept of privacy and the public domain. I have written elsewhere on this important issue which I believe is central to Islamic housing development. On the old public housing layouts, the main gates to each lot give out directly on a road, all of which are local distributors. In the revised system, all houses open either onto a cul-de-sac, or onto a private access and parking area where there is a local distributor. Under both these conditions an additional semi-public zone has been created, to the benefit of those living in the adjacent houses. Two different basic designs were produced for those nationals requiring housing – for ease of conceptualising them I will refer to them as the ‘traditional’ house and the ‘modern’ house. There was, firstly, a house that was considered to be a traditional building suited, it was thought, to those coming into modern housing for the first time and, secondly, a house that was more similar to a Western or modern house. The essential difference was the greater amount of open space provided under cover by the traditional house compared with the modern house. The important point to note here is that both types of house were designed as villas standing at the centre of their thirty-metre square plot with its surrounding wall. The top photograph shows one of the ‘traditional’ houses under construction, prior to the external boundary wall being erected, the lower photograph shows one of the standard public houses. The modern house was similar to those already being constructed in Doha for ex-patriates and others being brought into the country to provide the service industry for the country. The construction was of concrete blocks and reinforced concrete with wooden doors and metal framed windows. Apertures were generally provided in the walls of each habitable room, including the kitchen, in order to accept wall-mounted air-condtioners, a requirement created by the buildings’ design and construction method. Note that the walls of the ‘traditional’ house above do not have provision for wall-mounted air-conditioners built into them, though the standard public house does. Also note that the area around the public house, but within the boundary wall, has little privacy. the house being located more or less in the centre of a 30 x 30 metre lot, originally a 100 x 100 ft. lot. I have a feeling that the lots were originally smaller, but am really not sure. For comparison, Senior Staff housing lots, a type that were established later than the public housing lots, were 35 x 25 metres square. Provision was made in the boundary wall for pedestrian and vehicular entrances, both of them fabricated from flat steel panels, made rigid by welded steel straps in a decorative pattern. No garage was provided. There were design variations made on the public house, but the essential space requirements in terms of the above uses and areas were more or less constant. The chief difficulty with the public house was the lack of consideration for the privacy of the family. On other pages I have argued for this being the main criterion in the design and layout of both the house as well as the house lot. When this issue is not addressed, the family suffer in that they are unable to use their house with any degree of freedom. The problem can appear complex, but thoughtful consideration will produce a range of optimal solutions that allow the family to operate safely within their lot, both inside and outside the house. In the first houses there was conflict between the family activities and the public part of the house – the madkhul, majlis, ghurfat al-sufra and hamaam – the areas in which male guests have access when entertained by the man or men of the household. Men are able to move around these areas freely and it is important that they do not come across or see female members of the family. The conflict arises when the women of the house are unable to have unseen access between the matbakh and the ghurf nome and associated hamaam. While it is possible to use the doors to create privacy, there is certainly a lack of freedom for the family and their movements around their house. This problem existed in both the modern and traditional house types. Because of the problems described above, both with the house and with the housing layout of public housing, an exercise was undertaken to produce an improved public house as a basic unit of the improved site layout. The team spent time studying the way in which people lived, and it was decided to concentrate on a redesign of the traditional house rather than the modern one. The reasons for this were mainly to do with the sensible response these buildings produce to the environmental conditions of the peninsula. With the passage of time, it is evident that it would have been more sensible to concentrate on the modern house. While the planning problems are similar to those of the traditional house, the manner in which the modern house responds to the environmental conditions is more difficult to resolve than with the traditional house. Having said that, later work with the Senior Staff Housing project on the New District of Doha dealt with many of those issues. The next three sketches illustrate the traditional house that was produced as an integral element of the housing layout shown above. Remember that these are basic sketches with no real customising. There is no area for animals or storage, no landscaping or play area. Also the design has been slightly amended from the designs produced thirty years ago in that there is a partly covered external majlis adjacent to the entrance to the building’s majlis. In addition there is a small amount of styling to the roof parapet where I have implied a badgheer, a traditional feature that would be necessary with any tall parapet in order to flush the dead air from the roof. The first sketch illustrates the building from its front onto the road outside, the second and third sketches illustrate it from its sides. The first sketch shows the main entrance and the external majlis together with their associated spaces. This is the area that only the male guests will see if they are invited onto the site. It is often the area into which expense will be put in order to demonstrate the generosity of the host. The area incorporates a small, manageable garden that will form the visual and, perhaps, aural focus for guests. The second sketch is taken from the garden side where the matbakh and its associated external cooking area is the most prominent feature. A partially open garage is shown on the left with the family entrance adjacent to it. The windows to the right are those associated with the the main, two bedrooms, the bathroom being located between them but its window high and masked by the downstand beam. The private garden occupies half the site. The third sketch shows the private family courtyard with a broad verandah and access to the roof incorporating a high screening of the stairs and roof in order to maintain privacy not only from adjacent properties but also into them from the house. Generally the roof is articulated in order to shade the windows below it. This is particularly so for the larger windows of the majlis and ghurfat al-sufra adjacent to the main building entrance which can be glimpsed in the top sketch. I mentioned that the private garden occupies half the site. This area can be arranged as the family wish but, in the traditions of the peninsula, there is sufficient space for adding many of the uses mentioned above, as well as building more accommodation for an extended family. This next sketch is a horizontal section taken midway between the top of door height and the ceiling. It is intended to show how the screening of windows is accomplished by dropping the parapet. In addition to controlling some of the solar gain, this technique helps in maintaining privacy both into and out of the building. You can also see the gate and screen wall linking the garage to the house, and providing privacy for any residents in the garden when guests use the main entrance. Elsewhere I have argued that the positioning of a villa-style house in the middle of a plot has many disadvantages, despite it being the arrangement of choice by many potential clients. The rationale they argued was, essentially, that their houses would not be safe from potential intruders accessing their roofs from the adjacent housing. Counter arguments focussing on there being little difference between crossing a boundary wall or a roof wall, and Islamic law supporting complaints against various forms of intrusion – visual, aural and physical – seemed to have no effect. Additionally, the arguments that there was little way of blocking visual intrusion from roofs into the open areas of adjoining properties, held no sway. There are many ways to provide screening between properties in terms of the materials used, their elevational positioning and in their detailing. For the purpose of these sketch illustrations the screen has been notionally treated as being composed of horizontal ribs but, in real terms might be designed in many ways to account not only for their purpose in screening neighbours’ properties, but also taking consideration of solar and noise issues. Additionally it would be necessary for screens to be designed to accommodate wind loading and, perhaps, loading due to climbing plants and the like. In these notional examples, a simple thirty metre square plot has been assumed as the basis of the exercise, and only the side adjacency alternatives are shown. Variations on the square configuration might also bring advantages, but was not examined here. This first sketch illustrates the easiest way to provide a reasonable degree of privacy between neighbouring plots. The only way to see into a neighbour’s property would be by climbing a notional two metre wall. Access into that neighbour’s property would be easiest climbing over their boundary wall – the same condition which applies to all present properties. In this arrangement all properties have the same orientation with regard to the sun and wind. In this illustration, the houses are mirrored in pairs. Good design would require different treatments of the two houses with respect to environmental conditions, issues that are not dealt with in this example, nor in the Popular Houses. In this example it might be argued that access from one roof to a neighbour’s roof would be easy but, firstly the party wall would be of a similar height to a boundary wall and, secondly, additional security might be provided either by raising this wall or by providing disincentives to climbing or viewing, such as planting or a more physical, built, deterrent. This sketch suggests that the screen on the party wall at the front of the property might be reduced in response to potential sight lines from the roof of one property into the neighbouring property. Its exact profile would be readily calculated and defined. It is unlikely that a similar, raked, solution would be possible at the back of the properties where the third bedrooms face each other. None of these sketches take consideration of planting as a means of improving security, noise reduction, shade and the softening of the environment for those moving in and around their properties. Nor, as suggested above, is there any allowance made for the orientation of the houses. Both these issues could be relatively easily dealt with. Here is a plan of the three-bedroomed traditional public house that was designed for those coming to a modern building for the first time, but wishing to live in a more traditional manner. There are a number of important points to note with respect to its differences with the modern house as well as later Senior Staff housing. The house is not located in the centre of the property but is sited in such a way as to use one of the party walls with its neighbours. I am aware that this is not popular but it is an accepted use in many Arab countries both in the region and elsewhere, and there is established Islamic law governing such use. Talking with Qataris it was apparent that it was less a concern for people to climb over the wall but more that they were concerned for the privacy of their family. Other issues, such as noise, noxious use and the like, are all covered in law. Because the building is not in the centre of the site, less than half the lot is built upon and that half is given over to the family to use as they wish in privacy – assuming that adjacent houses are constructed on the same principles and will not have a view into the lot. There is clear benefit in not having the house in the centre as the remaining space is otherwise spread around the building, reducing the scope for alternative arrangements. The family courtyard is connected to the family garden by a narrow sikka in order that items may be taken between them. An alternative method is to take them through the external kitchen working area and verandah. however, this latter door might easily be omitted depending on the way in which the family organise meals for guests. There is also the issue of noise from the kitchen which, being a hard surfaced area, and likely to have a number of people preparing food there, can give rise to nuisance. My experience is that food is moved from the kitchen to the ghurfat al-sufra before guests are invited to eat, and that the door from the hall or majlis to the ghurfat al-sufra will be kept closed if the women of the family or servants move the food through. If the men move the food through then that will be organised in such a way that guests are unable to see anybody in the kitchen. Guests will leave the ghurfat al-sufra in order to wash their hands and mouths as and when they finish eating. At that time it is not sensible to have the door between the hall and verandah opened as the family are likely to be compromised. Essentially these are operating problems and will be resolved by each family depending upon family circumstance and convenience. The provision of the two routes for food from kitchen to ghurfat al-sufra is believed to permit a degree of flexibility. In the left diagram of this illustration, the blue areas are those associated with guests or visitors to the site. They comprise the entrance space and wash room, majlis and ghurfat al-sufra, together with the associated external spaces of a small landscaped garden and the shaded car port. As explained above, there is no direct access of sightline from the public spaces into the private spaces other than the possibility of doing so through an opened door. On the right hand diagram there is an indication of those areas of the public space that are enclosed, shaded and open. The reason for this is important. The next principles used in the design relate to shade and enclosure, extremely important issues in the development of traditional buildings. For much of the year the external space is preferred to internal, enclosed spaces, particularly by those more familiar with desert life. For this reason there is shade at the main entrance to the house, a space that is associated with the ghurfat al-sufra and directly accessible to it. There is also a built-in external majlis adjacent to the internal one which can be used for much of the year, particularly in the evenings in summer, and which is partly covered by the building’s roof. On the private, or family, side of the house, the main living area is the verandah which is broad and relates to the kitchen, the bedrooms and the family bathroom. The verandah is also connected directly to the external cooking area adjacent to the kitchen. In addition to this there is access to the roof from the verandah enabling that space to be used and enjoyed in the cooler months of the year and at night in summer. The verandah is the living space for the family, traditionally having all the family’s activities relating to it directly. The family is able to live in complete privacy here, in the associated rooms and the adjacent courtyard, the roof being extended to give shade both to the verandah and the external cooking area as well as providing some shading to the windows from the high summer sun. The rooms that are enclosed all allow cross ventilation from the verandah with the intent of their being kept relatively cool even at the height of summer. In winter, it is relatively easy to heat these rooms economically. Previously I touched on the subject of the accommodation provided for guests. The madkhul, majlis, ghurfat al-sufra and hamaam constitute these spaces and are implied internal volumes within the building. But they can also exist outside if the main guest entrance to the property allows people onto the lot where they may find an external majlis, though more usually it is located outside the boundary wall as is demonstrated in the photographs below. The majlis is the area in which guests spend most of their time when being entertained by a host. It is also the room in which they might spend a night if they need to sleep. Though this is far less common than it used to be, there is still a case for using the majlis for this purpose, particularly for those still leading a relatively traditional life and, consequently, with relatively traditional friends and family. Nothing much is required of the space other than a dowshek and, perhaps, misnad. But the majlis is essentially the space to sit and talk, watch television or video, listen to music, play cards and generally relax with friends. While people like to sit in some degree of comfort, it is surprising how much of the year will see people sitting outside and enjoying the more natural conditions of temperature and humidity, and perhaps more important, the psychological enjoyment there is in not having the sense of enclosure a room brings, especially that associated with the ceiling height. The external majlis area or baraha, is nearly always defined in some way, sometimes by a carpet or rug, even a row of blocks, and within it will be a run of seating, generally no longer on the ground if the surface is concrete or tarmac, and can be of regular armchairs or, more traditionally, a dikka with masaanid for additional comfort. These two photographs illustrate the character of informal arrangements to carry out the function of the baraha in the evenings. In the first example the baraha is immediately outside the majlis and, in the lower photograph the chairs are aligned along the boundary wall adjacent to the main entrance to the site. Neither of these photographs is of a traditional house, but what is demonstrated is certainly representative of the requirements that all hosts have to sit with their guests. This photograph is of a concrete, built-in dikka outside the rehabilitated wind tower in the centre of Doha’s suq. It is the model on which the external dikka has been modeled on the traditional house scheme above. It is placed here in order that it can be compared with the wooden dikka in the photograph above. The curved element acts, to some extent, like a misnad, though is likely to be covered with rugs, and masaanid are still likely to be used for comfort. The habit of sitting outside is the reason the traditional house design has an external majlis or baraha designed into the scheme. It sits adjacent to the majlis within the boundary wall, a position made possible by the privacy safeguarded for the family. The only disadvantage to having a baraha inside the boundary wall is that those using it can not be seen by passing traffic nor, of course, can passing traffic see who might be there. However, if the boundary wall gate is open, and the lighting is on, then those sitting in the baraha may be glimpsed by anybody passing. The point of this is that the baraha is very much a public-oriented activity and might additionally be thought of as form of display. Because of this, the degree of exposure is an issue that will be decided by each owner, balancing exposure with signalling that a majlis is open to visitors. As you can see from the above illustration, the design of this particular baraha is of a limited capacity in terms of the number of guests that will be able to sit there. The simplest solution would, perhaps, be to leave the space in front of the majlis empty and allow the owner to decide what to do with it. But the purpose of designing the traditional house was to demonstrate how the house might be enjoyed. So, here is an alternative way of dealing with the entrance, by providing a larger baraha that can be used easily at different capacities. There is also the possibility that entrance made through the boundary wall might be better focussed on the baraha, an alternative that would give it more prominence than the internal majlis, and might be argued to be a better solution for a traditional house. This top sketch illustrates one possible arrangement, with the boundary wall being taken away to clarify the relationships between entrance gate, majlis entrance, baraha, landscaped area and the main entrance to the house. The car port is cut away on the right. The lower of these two sketches illustrates a more formal relationship between entrance, baraha and majlis, with the three elements organised on a central axis. The main entrance looks straight out at the landscaped area, and it can be seen that there is still a degree of flexibility in organising the relationships between this and the majlis, ghurfat al-sufra and madkhul. The boundary wall has again been removed for clarity. A number of issues need to be considered in the design and location of the ghurfat al-sufra in a traditional house. Privacy, noise, location and access are the main concerns which, in some cases, are inter-related. What has to be borne in mind is that although these may seem to present identical problems to those found in Western houses, there are many differences which, if unresolved, will make the house uncomfortable or difficult to live in for the family. The first issue has been discussed briefly above and relates to privacy; the second has to do with the impact of noise from the matbakh on those using the ghurfat al-sufra; the third deals with the relationship between the two spaces; and the fourth, partly related to the third, is the relationship between these spaces and the hamaam. Privacy has to do with both aural and visual issues. It is essential that walls, screens and doors are situated in such a manner that prevents the family being seen by male guests to the house and its public garden, if there is one. Interestingly, in some parts of the Arab world, buildings were constructed with the ability of women from the family able to see activities of guests while remaining unseen themselves. This may still be a possible design principle though I know that there may be concerns about the confidentiality of mens’s conversations. While it may be relatively easy to place walls and doors in sensible locations, difficulties arise in operation when food has to move between the ghurfat al-sufra and family side of the house, particularly the matbakh. While this may be resolved by careful organisation of family movements, the sequence of movements, together with those of the guests, should be thought through in detail in order to provide the optimal arrangement giving as much freedom to the family as is practicable. Not only should the family not be seen, but they should not be heard by guests. The problem of noise might best be considered in relationship to insulation and source. The traditional Arab kitchen can be an extremely noisy place. All the built surfaces are hard and reflective, the pots and pans are metal and there are usually a number of people working there with, as you might expect in a family, a lot of talking or shouting. It is important to the host of a meal that there should be minimal disruption to his meal from noises outside the ghurfat al-sufra. It is also anticipated that women and servants in the matbakh should not be able to hear the guests’s conversation in the ghurfat al-sufra. This suggests that that there should be no door between the ghurfat al-sufra and matbakh. In the traditional house scheme above there is a door between them but, on reflection, it would be better for it to be omitted. Firstly there would be a significant reduction in sound and, secondly, there would be more wall space along which to locate working surface and cupboards within the matbakh. There is also the possibility, if not the probability, that food will be prepared outside the kitchen. There are obviously no windows on the garden side of the ghurfat al-sufra as, not only would they overlook the family side of the site, but there might also be a significant noise problem. Despite this, it might be sensible to provide a high level window in order to provide cross-ventilation to the room, in this case balancing the possibility of improved environmental conditions with the probability of aural disturbance. Traditionally in the West, dining rooms tend to be located adjacent to kitchens in order to reduce the travel time for moving food between them, the object being to ensure food stays warm, as well as for convenience. In today’s houses, this is less of a problem and it has become normal to have the rooms adjacent to each other or, as is increasingly fashionable, within the same space. In the case of traditional Arab meals, this latter arrangement is not possible. Nevertheless, having the two spaces adjacent makes sense provided that the issues previously mentioned can be resolved satisfactorily. But the optimal arrangement is likely to require an intermediate space between them in order to deal with these issues. In either case the layout should consider both physical barriers to create privacy, as well as the operation of the household in the movement of food. Designers should also be aware that the pots and dishes associated with traditional cuisine can be both heavy and cumbersome, and that there can be a considerable number of guests. The former is particularly true of a large machboos where the presentation of the food is on a large circular tray and consists of a bed of rice with the cooked meat on top of, and around it. These dishes can be too large to take through a standard door and a double door is likely to be required. An alternative arrangement would be for there to be no door to the ghurfat al-sufra, and for there to be a curtain on a circulation route, an arrangement I have seen in practice. There is still the need for a wide opening from the matbakh both to the ghurfat al-sufra as well as to the external cooking area. The hamaam illustrated in the traditional house above was a minimal arrangement, similar to that actually built by the government. However, it does not really respond to the real requirements of the house and, in retrospect, was not the appropriate design response. Here is a detail of the above plan showing its relationship with the entrance hall, and the positioning of a door between the entrance hall and the family side of the house. In the bottom right corner, there is a door between the ghurfat al-sufra and the matbakh, a door that would be better omitted. The washroom in the traditional house serves two different purposes, as it does in more modern houses. Firstly, it is the guest bathroom when it will be used by male guests in the majlis or baraha, as well as anybody staying overnight in the majlis. Secondly, it is the washroom for those using the ghurfat al-sufra. The consequence of this is two-fold. Although rarely included, it would be useful to have a shower facility in the washroom both for overnight guests as well as for the man of the house to wash without going to the family side of the house. But the more significant difference is the provision of washing facilities for those using the ghurfat al-sufra. What is not usually understood by designers is that an ordinary washroom will not fulfill this requirement. Generally a hamaam will incorporate a water closet, usually Asian, and a wash hand basin. But to work properly there needs to be a larger number of wash hand basins than a single one in order that guests, leaving the sufra as and when they finish eating, can wash their hands. The consequence of this is that guests will have to queue with dirty hands as they wait for a single wash hand basin to come free. Whatever the arrangement or number of wash hand basins, there needs to be a reasonable amount of circulation space around the basins as guests queue to wash and dry their hands. It should also be noted that the water for washing hands is left continually running, the floor tends to get very wet, and there needs to be space for towels and a full length mirror. In fact the better solution would be to have a wash room containing a run of wash hand basins, and a separate toilet with a water closet, wash hand basin and, preferably, a shower though this solution would, of course, require more enclosed space and attract additional cost. In some houses I have seen wash hand basins located in a circulation space in order to ensure that guests are properly catered for. It is apparent that this can be an important consideration for some hosts. This sketch is a compromise solution incorporating most of the recommendations, though there is no shower possible in the hamaam even when expanded to this size. Note two other changes: the door between the ghurfat al-sufra and the matbakh has been closed, permitting increased work space in the matbakh, and the door between the verandah and entrance hall has been enlarged to permit larger dishes to be brought through from the matbakh to the ghurfat al-sufra. However, remember that this will require the door to the majlis to be kept closed if the women of the house are to bring the dishes through. In most houses I have witnessed the men bringing the food through in order to avoid this problem. However, if the stairs were rearranged, the additional space would allow the possibility of an increased arrangement, probably incorporating a shower. 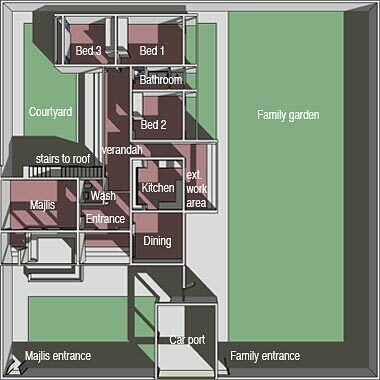 In this plan there can be seen to be improved privacy for those using the staircase to the roof, as there is masking into and from adjacent properties. Ventilation and some daylight can be readily provided to the private wash room, and this might also be a way of dealing with the hamaam by keeping the wall between the two wash rooms low and glazing between them though ventilation still has to be provided. The design problems are not insuperable. Note that a hot water cylinder has been provided in a separate, enclosed cupboard providing hot water to at least the wash rooms. A little more about that later. This lower sketch illustrates the relationship between the amended matbakh, the external matbakh, the hamaam the ghurfat al-sufra, majlis and madkhul – the entrance hall. The matbakh in traditional houses should be thought to encompass not just the enclosed kitchen, but also the external area adjacent to it as well as areas of storage. As has been mentioned elsewhere, meals can be extremely large, requiring a significant amount of storage for basic requirements. Some of this can be kept in the kitchen, but some of it is likely to be stored outside the building, in adjacent areas. This is likely to be true for items such as rice, vegetables and fruit which may be required in large quantities. But you should also be aware that meat is required daily and may also be live. The cupboarding used in Western kitchens is not necessarily the most useful for Arab families, and worktop levels are generally too high. The cupboarding below worktops will take pots and pans, though not the large ones which are often stored on edge outside leaning against a wall. Cooker hobs may be too small for the pots that are customarily used and need to be carefully considered. It is probable for this reason alone that an external cooking area will be required. The preparation of traditional coffee is also likely to be carried out in a permanent position outside the kitchen, and preferably in a covered position. With reference to large pots and pans there is also a difficulty experienced in traditional and modern public houses with washing large pots and pans. Commonly the bathroom is used, but this is obviously not the best way of using that room. It is sensible to provide an external washing area where such washing might take place. Any tap provided should be sufficiently far off the ground to be able to allow items to be placed below it, the use of water there should not be a hazard, and water should go to a proper drain. Often this tap is operated with a hosepipe attachment in order to used for operations other than the washing of food and the cleaning of pots and pans, butchery and other uses I won’t go into here. In this traditional house scheme the kitchen was provided with a floor to ceiling open rafuwf, or shelf system that would allow for optimal storage. A refrigerator would be located below it. The passageway adjacent to the kitchen is sized to enable large dishes prepared in the external cooking area to be carried along it and on to the ghurfat al-sufra. Nothing should obstruct that route. 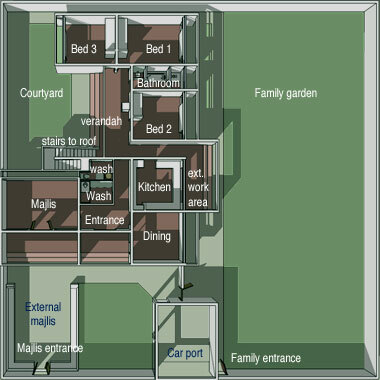 Looking at the layout of the kitchen it is evident that there is another alteration that might improve the way it operates. In the illustration above there are two doors giving access to the corridor and to the external cooking area. One of those could be closed, as in this illustration, with benefit though I suspect that the a two door layout would be preferred in order to get optimal cross ventilation as well as providing better possibilities for movement in and around the kitchen, though at the loss of worktop space. There is a need to keep water and soft drinks cold, often a problem in continually hot kitchens where it can be impossible to keep the refrigerator cold due to constant access. This suggests that drinks should be kept elsewhere, often in a second refrigerator. This needs to be located in a sensible position where family have access to it, particularly by the children, and where drinks are available to give to guests. Often this will be on the verandah, even though it is open to the environment, but where it is also accessible to those using the bedrooms as well as the kitchen. There may also be a need for the refrigerator to take items such as large bowls of iced water in which fruit is kept and served to guests. Although the sketch plan further up the page is small, you may have noticed that there is no provision for services. The reason for this was that both the traditional and modern houses had simple service connections. Many were constructed with septic tanks that were eventually connected to a mains system. Electricity was supplied as a three-phase system, sometimes subject to interruption due to loading or damage to lines. Cold water was piped to a galvanised tank on the roof and from there was gravity fed to hot water cylinders – one in the kitchen above the sink, and one in the bathroom above the bath. Where there was a washroom, there would be another as close to the wash hand basin as possible. hot water cylinder. Where possible the positioning of the hot water cylinder was, in these schemes, intended to be located in such a position that would limit injury in the event of their failing. The reason for this was that a number of items sold to Qatar in the early years of its development were sub-standard. This applied not only to items such as hot water cylinders, but also to materials containing, or made of, hazardous materials. There are comments on other pages dealing with this in more detail, but the purpose of this page was to reflect the practice a generation of ago. Despite this, the design of the housing tried to locate the hot water cylinders sensibly and suggested that shade was provided to the cold water tanks on the roof. You should be aware that the practice in those early days was to use the cold water tank on the roof to supply cold water in the winter, but warm or hot water in the summer, the hot water cylinder, switched off, supplying the cold water. The family side of the house comprises all those areas which are not given over to guests: the majlis, the ghurfat al-sufra and the hamaam, together with the circulation spaces associated with them and the external areas also given over to guests. This is approximately a quarter of the site, but the focus of family activities will always be the enclosed or covered areas where the family can enjoy privacy. Traditionally, the verandah would have been open with a covered roof; but you can see from this sketch how easy it would be to close it in. Even in modern Qatari houses it is not uncommon for the family area to be located in a circulation space, even when there is a sitting room available. This appears to be something to do with the woman of the house needing to be aware of, and direct, the activities of the family. In the traditional house this focuses on the verandah and the spaces running from it: the ghuruf al-nome, hamaam, matbakh and the daraj giving access to the roof. The courtyard is the natural focus of the family’s activities, but there is also the garden which takes up about half the lot. In this space will go storage, animals, play areas and a variety of items to suit the activities of the family. A part of it is likely to be taken over by the man of the house to store items such as camping equipment, cars and items connected with the way in which he makes his living. There is also a tendency for accommodation to be constructed for servants. Some servants sleep in the house, often on the verandah or with the children. By servants you should also understand that these may be members of the family and the term does not have the pejorative feeling it may have in the West. As I have mentioned elsewhere, servants’s accommodation was often constructed on the boundary wall and a small shop incorporated into it, the servant acting as shopkeeper and watchman. Where this occurred it was more usually the garage that was converted, but the point is that the front boundary wall is likely to take development such as this, taking up some of the private garden space. The family bathroom will be used by all the family, men and women, boys, girls and servants unless the latter and men use the facilities in the guests’ side of the house. This layout is, again, not quite as the original State-designed traditional houses were laid out. In that case the wash hand basin was of a pedestal design, and the bath had a ledge built in at the sitting end. The Asian toilet was standard. In this sketch the wash hand basin has been inserted into a work top in order to be able to provide a cupboard below it for cleaning and other material, as well as having space adjacent to the wash hand basin on which to put some of the many items a family needs to have to hand. A mirror would also be provided here. A degree of privacy has been given to the bath by the use of a partition and space has been provided for washing materials both at the side and at the tap end. The Asian toilet has been given its own cubicle and would contain the toilet itself together with the stand point and hose required for ablution. This might be openable for ventilation as would, of course, be the window in the external wall. Some natural light has been provided by a borrowed light above the partition. This arrangement of the bathroom is deliberately more up-market than the State provision was. It is hoped that this would encourage better use of the bathroom by all the family. Earlier I mentioned the need for an external wash area beside the kitchen. The reason for this is that many families used the bath in which to clean their larger pots and pans, the kitchen sink being too small and its taps too low to enable the cooking items to be cleaned there. This resulted in a series of problems with the baths, from cleanliness to clogging of the drains. Although three of the rooms of the traditional house scheme have been labelled as bedrooms, there has always been a degree of flexibility in their use. As mentioned previously, traditional families would often sleep on the verandah, only using the rooms behind for warmth, coolness or privacy. As a consequence it was difficult for the State, as well as for consultants, to design a layout that would have optimal use for families moving into their first modern house. At that time there was little furniture to be purchased from the retail industry and those moving into traditional houses would have brought with them their old furniture and habits. Essentially this would have consisted of boxes in which clothes and other items were kept, other clothes being hung on hooks or strings, and usually beds were mattresses on the floor. Because of this the decision was to provide space for storage and for hanging clothes as this would take care of immediate practice and the same space could be developed for a proper built-in wardrobe at a later date. The sketch illustrates the way in which the storage area has been designed. The area below the horizontal raff would be used for hanging clothes, a location that might also be used for the traditional chests. The raff will accommodate larger items requiring storage. When developed, the room is large enough to accommodate a normal layout for a double bed or two single beds, along with free-standing wardrobe, chest of drawers, sides tables and the like and can be considered to be no different from a normal bedroom. With regard to lighting and ventilation there are windows situated adjacent to the internal walls of the bedrooms. They are partially or wholly openable as well as being full length in order to produce the optimal penetration of light deep into the room. In addition to this, the flank walls will reflect light into the room despite the external downstand shading device protecting the windows from the summer sun. In addition to this there is a high level opening provided in the room, masked by the external downstand. This allows hot air to be released passively, but it also enables through draughts to be created to help cool the room. I should also mention that early houses were routinely fitted with centrally located, ceiling mounted three speed fans. This was, and is, a useful way of circulating air within a room and producing a cooling effect on the body, though they could be noisy at full speed. The roof illustrates a notional badgheer that will help sweep the surface of the roof and reduce heat build-up. This was a feature of traditional architecture that still makes sense particularly, as is likely to be the case in the design of the traditional house, if the roof is to be used by the family. Here, then, is a revised scheme for the design of a traditional public house based on the experience gained since working on the first design in the early seventies. It should be compared with the plan of the original traditional house above. This sketch takes account of the amendments mentioned in the previous paragraphs as well as some other small alterations. In a sense it is a solution to a problem that no longer exists. It is a theoretical exercise, the purpose of which has been to re-examine a design project completed many years ago and, with the benefit of hindsight, see if it might have been improved. In doing so it has been possible to make a number of points to do with the way in which traditional houses were used. It will not be perfect but it does present better ways of living for those who would have moved into such as design. It is also more expensive, though this might not be the problem it would be outside the Gulf as there were sufficient funds to spend on housing nationals. The following four aerial sketches illustrate the same project with the roof and parapet removed. This shows the clerestory windows that assist with the movement of air through the bedrooms, ghurfat al-sufra and majlis. They look from the four corners and are intended to illustrate something of the character of the revisions. The first looks into the private courtyard that is the focus of family life based on the verandah and the rooms that are linked to it. Easy access can be gained to the roof in privacy, making the ground and first floor a significant area available to the family by day and night. Storage space is available under the stairs and the courtyard may be paved or grassed depending on the manner in which the family wish to enjoy this space. The screens giving some protection from the sun to the windows can be seen as can the openings at ceiling level in all rooms, enabling hot air to vent and cross ventilation to be introduced. Two wash rooms have been provided: one for the family and one for guests. The former contains a Western toilet and shower, the latter making it useful to the man of the house, the other has three wash hand basins and an Asian toilet. The central two sketches look over the family garden, the area that is likely to be used for storage, animals and a variety of uses, and to which all members of the family are likely to have access. The relationship between this area and the external cooking area is plainly seen. There is the possibility that the car port will be developed to house accommodation or a retail unit, or combination of both. As was discussed above, the external majlis or baraha has been expanded to form the focus for guests moving onto the site, rather than through the garden. The latter still remains adjacent to the baraha and facing the main entrance to the house. The adjacent dining room now has access to the external space containing the entrance doors enabling food to be eaten there, essentially expanding the options for using the guests’ area of the house. Here, then, are some small sketches of the revised scheme with the roof and a 1.85 metres badgheer added. Note, in the first sketch, the notional masking of the staircase to the roof in order for anybody using stairs not to be seen nor to be able to see into the adjacent property. This courtyard enjoys significant privacy, albeit visual, any aural problems would be related to the configuration of the adjacent house or road system and could be ameliorated by planting both outside or inside the property. In the lower of the two sketches, doors to two of the bedrooms can be seen together with that to the kitchen, the latter of which is located in the corridor that links the courtyard to the family garden, and which will provide a measure of air movement to the benefit, in particular, of the courtyard. This sketch gives a view of the private garden, looking from its boundary wall towards the outdoor cooking area adjacent to the kitchen. The garden has no planting in it but it is anticipated that planting, such as periwinkles, would be provided beside the bedroom windows as would a plant such as bougainvillea on the boundary wall, both of them being particularly popular at the time, as they are still. The public house was always built up as is illustrated on this and other sketches. The reason for this was a result of drainage systems being incomplete in the early years with the resulting tendency for plots to flood in the winter rains. With time this became less of a problem but there still seems to be an attraction at looking down on the garden. These final two sketches are intended to give an indication of the public entrance to the house. The upper sketch illustrates the importance of the baraha and its location in front of the majlis. The sketch also shows how the car port is likely to be used by visitors, a common practice seen when carrying out research into public housing. As explained above, this area of the lot was often developed as a shop or accommodation, the practice of developing a small baraha adjacent to it depending on its location and the importance of the house owner. The lower sketch is intended to show how open the house might be from the entrance to the site and baraha. Here you can see the majlis, madkhul and the adjacent window to the ghurfat al-sufra, all of them important spaces from the point of view of the owner, his male guests and their mutual entertainment. Although there is a little styling, the sketches are not intended to represent finished designs; the styling is there to represent principles discussed previously, in this case particularly those of the badgheer and the mirzam. One point that was not made earlier is that the house is considered to work relatively well whatever the orientation. As with most buildings, there are favoured orientations, but with a degree of solar protection to windows, the provision for cross ventilation and visual privacy issues resolved, the building may be oriented in any direction with minimal individual corrective treatments. This is the revised scheme that should be read alongside the lower of the two planning layouts illustrated further up the page. Before any of the above schemes were developed, a series of quick exercises were undertaken to look at the possibility of providing a different character of house for Qatari families. The suggestion had been made that there would be benefit if the male and family sides of the house were to be more clearly separated. This led to the thought that the houses might have access front and back, compared with the Public House where all entrances were at the front of the house. It seemed to follow that a narrow plot might be provided with access roads at both ends, or possibly with a sikka linking the entrances of the family side of the plot. These three sketches are all that remain of the first exercise, and date from the early nineteen-seventies. They are placed here for the record and not as good examples of housing. They can be usefully compared with later schemes for expatriate housing. There were several difficulties with this approach. One of the chief conceptual problems was the absolute opposition Qataris had to living in housing with party walls, an issue mentioned elsewhere in the development of the housing for the Sulaiti family. The argument generally given was that it was easy for thieves to jump over the wall; a secondary factor being that there would be less privacy. While it was reasoned that thieves can jump over any wall and that there is, in fact, better visual privacy with this type of development, these arguments – together with the obvious difficulty in expanding the house within the plot unless it is raised another storey – effectively put a stop to the study of this type of housing. The sketches show a clear distinction between the areas normally used by the men of the house and their guests, and the family. The majlis and ghurfat al-sufra are closely linked and there are obvious areas between the majlis and entrance where an external majlis might be located. Importantly, the ghurfat al-sufra can be entered from the family side of the house for serving and removing meals in privacy. This operation is usually supervised by one of the men of the house, usually the host. A family room is located at the other end of the house where the women of the family can meet and entertain in much the same was as men can meet in the majlis. Three bedrooms are provided in each house, one of them having a notional en-suite arrangement, though this is not necessarily a sensible arrangement for reasons discussed elsewhere. The corridor is purposely wide and would act as a secondary sitting area, if not a primary one, particularly when related to the small patios. All rooms would enjoy natural lighting and ventilation with similar treatment of roof shading and air-movement suggested in other, later, studies and exercises. Although these sketches do not show it, there was consideration of extending the party walls upwards and providing staircase access to the roof. The argument for this was that it would be better to provide the access from the start rather than have ad hoc treatments added at a later date, perhaps endangering privacy between houses.